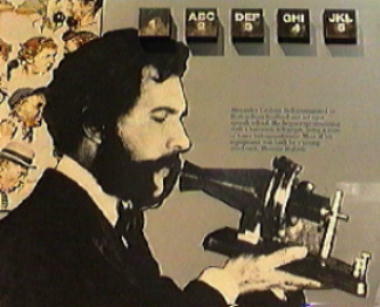 Alexander Graham Bell was born on March 3, 1847 to Alexander Melville Bell and Eliza Symonds Bell. His father and grandfather (Alexander Bell) were famous teachers of speech, and specializing in the correction of speech related handicaps including stuttering. His mother, even though she had difficulty in hearing low-volume sounds, was a good pianist and an accomplished portrait painter. 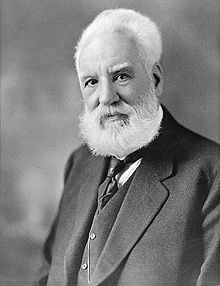 Since his name was the same as that of his father and grandfather, at the age of 11, he changed his name to Alexander Graham Bell. His family and his friends called him Alec. Graham Bell’s father indulged in sarcastic behavior quite often, and as a result, Graham Bell had a strained relationship with his father. Remarks, which his father thought were funny, often hurt him. Even when Graham Bell was in his early 20s, his father’s public berating did not stop: he continued making fun of his son in public. However, he got along well with his mother. He was a loner, and used to think and dream about different things during this period. Alec and his brothers were taught at home by their mother. When they grew up, they were sent to a local academy first, and then to the Edinburgh Royal high school. He wasn’t particularly bright, and had low grades compared to the other students. Apparently, he didn’t even finish high school. Around 1862, his grandfather, who was lonely at that time, invited Alec over to his house for an extended visit. Alec’s father agreed and paid him an allowance to spend while being with his grandfather. This proved to be a turning point in Alec’s life. Away from the dominating and over-powering personalities of his parents and brother, Alec’s personality finally started developing. His grandfather changed him inside-out. He bought Alec new clothes. Next, he prohibited Alec from reading books which he considered to be rubbish. Instead, they together started reading the works of Shakespeare. Alec’s grandfather also trained him to self manage his finances. By this time, his health started failing due to old age, and Alec assisted him with delight, knowing that he was finally of use to another person. He took care of his grandfather until 1863. A “new” Alexander Graham Bell returned home. Around this time, Sir Charles Wheatstone, a famous scientist and inventor, had designed what he called a “speaking machine”. Alec’s father was impressed by this, and asked Alec and his brother to design a similar and better device. They tried hard, but failed again and again. Finally, after a lot of persistence, they managed to build one. During the building of the speaking machine, Alec was totally focused on it. However, once it was finished, Alec started getting restless. Around this time, he saw an advertisement in a newspaper about Weston House, a boarding school. The school wanted pupil teachers. Alec immediately applied, and used his father’s name as reference. He was selected, and he spent one year at Western House, teaching students, some of whom were older than himself. In the next five years, three deaths occurred in the family. Grandfather Bell died in 1865, followed by brother Ted 1867 and brother Melly in 1870, both brothers dying due to tuberculosis. Within a few months after the death of brother Melly, Alec joined a school for deaf and mute in Boston, Massachusetts as a teacher. There he took a lot of private students and started his career as a professor of vocational physiology and elocution at Boston University. Among his private students whom he accepted in 1873 was Mabel Hubbard, the 16-year-old daughter of Gardiner Greene Hubbard. Mabel was totally deaf because of an attack of scarlet fever which happened when she was five years old. Her father hoped Alec would be able to do something about her deafness. As time passed, Alec helped Mabel a lot with her deafness, and along the way, developed a deep fondness for Mabel. The feeling was mutual. However, Mabel’s parents told him not to ask Mabel about marriage. This was around 1874, when Alec was 27 and Mabel was 17. However, after a while, Mabel’s parents relented, and Alec and Mabel became engaged, with the understanding that they won’t get married until Alec was able to support Mabel. So they waited. In 1876, Alec invented telephone and in 1877, Alec became financially independent to marry Mabel. They married on July 11, 1877. They spent one year in Europe, where they had a daughter, Elsie May. They returned to America in 1878 and Alec continue to help the deaf. This came naturally to him since his wife and his mother were both deaf. Alec and Mabel had a happy married life. Mabel used to say that she loved Alec for his faults. One of these was Alec’s habit of working all night and then sleeping all morning because of tiredness. He tried to change for Mabel, but couldn’t. She used to lovingly nag him for this. They had four children, but only two survived childhood. Alec became an American citizen in 1882 and settled in Washington DC. After staying here for three years, they move to Canada and lived there uneventfully for 37 years, until Alexander Graham Bell died on August 2, 1922, after a long fight with diabetes. The couple were so close to each other that Mabel couldn’t survive the death of Alec. Within five months, she too died on January 3, 1923. Alexander Graham Bell became famous worldwide for his invention of telephone. His efforts, which led to the invention of telephone, started with experimentation to make a metal disc reproduce the sounds to which it was vibrating to and send those over an electric wire. He started his efforts in 1872, and failed again and again. At this time, he didn’t have a lot of money and the equipment required for his creative work was expensive. He spent a lot of money to buy the equipment and as a result, became immersed in debt. He came under extreme pressure because of his financial situation. However, he did not give up. He continued with extreme persistence and consistent hard work. Around this time, he visited the first Sec. and Dir. of the Smithsonian foundation, Joseph Henry, who was born in Albany, New York. Joseph Henry was one of the leading scientists who had done a lot of research about the behavior of electricity. He asked Henry for help, saying he didn’t have any knowledge about electricity. Henry said, “Get It”. It took a whole year, but Bell “got it”. He acquired so much of knowledge about electricity that when he applied for his patent, the people at the patent office told him that he was the person with the most knowledge about electricity whom they’ve ever met. In 1874, another breakthrough occurred. Thomas A. Watson who was born in Massachusetts joined him as his assistant. Watson was extremely dependable and very loyal to Bell. After two years of trials and tribulations, on March 10, 1876, it happened. That morning, they were working on the invention by stringing a wire from Bell’s laboratory to his bedroom. Bell was in the lab and Watson was in the bedroom. And Bell proceeded to utter this historic sentence: “Mr. Watson come here. I want to see you!”. When he saw Watson walking into the lab, both of them immediately knew – it worked!! That is how telephone was invented, and we all know how much impact it had, and still has, on us. Though telephone definitely was the most important invention designed and created by Bell, he invented many other useful devices. These included a telescopic probe for detecting bullets buried in the human body; a vacuum jacket for administering artificial respiration; and some improvements to photograph (which was invented by Thomas Edison). He also invented a tetrahedral cell design which was meant to be used in the construction of bridges and similar structures with lesser weight and greater strength.